The signs of spring in the Northern Hemisphere are Aries, Taurus, and Gemini*. The energetic coding of these signs are Cardinal Fire, Fixed Earth, and Mutable Air. This trio moves us into the growing year. They tell a story. The story can be about spring, it can be about initiation, it can be about the relationship between fire, earth, and air. There are so many stories; that is one of the reasons I like astrology so much. The basic story pattern is fire sets the theme. We can ask, What needs kindling? How will we tend our energy? What is beginning? What will we dare? This flame rises up, improbably after the season of winter, and the Sun returns. Slowly, the Earth warms, and then the earth, as element and storyteller, takes over for the flame. What will sustain this fire? What will contain and focus it? Sometimes there is conflict between the impulsivity of cardinal fire and the solid, slow process of fixed earth. All stories need some kind of conflict, don’t they? Antagonism leads to resolution. That is the mutable sign’s job. For spring, Gemini, the air sign, light, floating, hard to pin down—as much contrast as possible to Taurus—is in charge of this season’s resolution. This must be a cosmic joke, surely, because Gemini is considered such a lightweight, not serious enough to bring the story to a conclusion. But like all cosmic jokes, there is an incredible amount of wisdom to find here. Gemini is a stealth sign, accomplishing more than we think by flittering here and there, with a wink and a trick. This story is unfolding right now. There is complexity in it. The Sun has already moved into Gemini, yet the lunar cycle, which was seeded by Taurus, has one week to go before the New Moon in Gemini on June 4. Complex stories are good stories. The solar part of us is already in the floaty world of mutable air. The lunar part of us has our roots in the dirt with our hearts surrendering to memories of loss as the lunar cycle wanes into the dark of the Moon. That dirt is essential for the next phase of the story. My intention for this lunar cycle was to “surrender to earth’s intelligence.” Whatever wisdom I’ve gained will give me the grounding for the next plot development. Complexity creates dynamic tension. I believe it is what humans are meant to incorporate more and more of as we evolve. But we’ve got to figure out a way that complexity does not also mean stress and anxiety. We need to soothe the part of ourselves that needs simple. We must be OK with imperfection and messy emotions. We also ought to get better at understanding that truth comes in many forms even when our own is a guiding light. These things that we need for resolution and evolution belong to the realms of mutable signs: Gemini – complexity, Virgo – imperfection, Pisces – messy emotion, and Sagittarius – multiple truths. Are you noticing these themes in your life? Complexity rules the day right now. Influences include the differences between Taurus and Gemini at the end of this lunar cycle, Mars returning to Scorpio, and the complexities of the relationships between all the mutable signs. 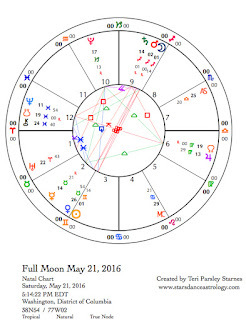 Planets in mutable signs are forming a grand cross aspect pattern through first part of June. I recognize my need for simplicity—the quiet calm of a zen garden, the spare tones of a bell ringing, soft touches of rain, the smell of freshly dug dirt. What calms the part of you overwhelmed with complexity? Here is one practice I can wholeheartedly recommend: Bhramari breath or the bee’s breath. The vibrations of this humming exhale can bring great calm. I find that it helps me experience more of the world’s vibrations without becoming overwhelmed by them. Here are instructions. Monday, May 30. Got your seat beat buckled? No, it really isn’t that bad but it might be helpful to have a plan or practice in place when things start getting a little jittery out there. A mutable grand cross aspect pattern is in place for the next few days. It comes and goes actually, strong at the New and Full Moon of this lunar cycle. A grand cross means that planets are in each of the signs of the same modality (cardinal, fixed, or mutable) and at nearly the same degrees of those signs. A grand cross includes four squares and two oppositions. It is generally thought of as stressful or provocative. There is a lot of one kind of energy—in this case mutable—and that can be overwhelming. To top if off, the Moon will be in a mutable sign for most of the day (CDT), too. The grand earth trine (another aspect pattern that can create harmony) is in effect. This pattern is waning but present. Mercury in Taurus, Jupiter in Virgo (one of the mutable signs), and Pluto in Capricorn are offering a grounding cord. Take it. The trine between Mercury and Pluto is exact today. This is the third time Mercury and Pluto make this contact with each other due to the recent Mercury retrograde. Thought and power come into right relationship. Our words make a difference. In Taurus, Mercury teaches that silence can be as powerful as speech. What are you communicating? Tuesday, May 31. Aries’ fire can clear away the underbrush or it can set the whole forest aflame. The Moon can act as a trigger unleashing pent up energy. The mutable grand cross of Sun and Venus in Gemini, Jupiter in Virgo, Saturn in Sagittarius, and Neptune in Pisces may have laid the fuel for a fire today. This grand cross is nothing to fear but mutable energy can be unsettling because there is so much to do and the nature of a cross makes it hard to focus on just one thing. The Moon in Aries encourages freedom. Free yourself from worry and enjoy the fascinating influences coming together under this grand cross. Big ahas are on their way. June 1—Balsamic Moon: Surrendering. I have a confession to make. Each year, I approach the Taurus lunation as the solution to all problems, or perhaps to all of mine. I have no earth in my own natal chart and this fixed earth sign seems to hold the answer to everything for me. Perhaps because I am sensitized to the gifts of earth, this season, when the world turns green and bursts into bloom, seems to hold more wisdom than others. 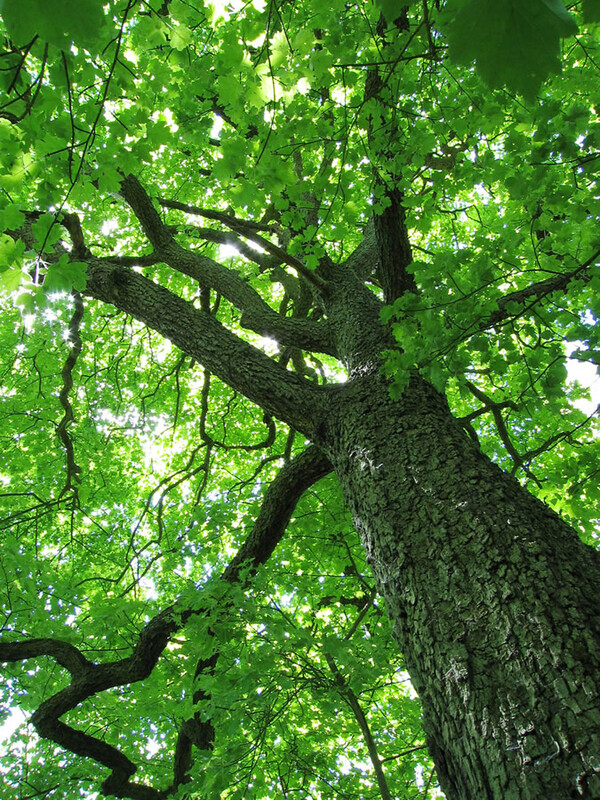 For this reason, I dedicated my lunar intention to this line from a Rilke poem: “If we surrendered to earth’s intelligence, we would rise up rooted like trees.” Yes, I do believe this is the key to lively wholly and justly in the world, to living with grace as trees in a forest do. This is why I am Pagan. This is how I practice my astrology—grounded in the wisdoms of the Earth. This Taurus lunar cycle is coming to an end. In fact, it might be hard to feel that deep grounding of Taurus now that the Sun and Venus are in Gemini activating a grand mutable cross. Mutable signs seek resolution to complexity. They are information processors. If we’ve had the chance to surrender to earth’s intelligence this month, then there is quite a bit of wisdom to integrate with all this mutable influence. I can’t stay in the Taurus season forever. It is time to move on as the wheel of the year turns. The Sun in Gemini makes a square to Neptune in Pisces, while the Moon in Aries forms an agitating conjunction with Uranus. Intuition may be telling us to make huge changes, quit the job, leave the marriage. It could be a good idea to give these impulsive thoughts a couple of day’s reflection to see if those insights are real. Neptune can dissolve barriers that need to come down and it can lead us deeper into illusion. Best to keep that in mind. Thursday, June 2. Mushy boundaries could instigate romance, infatuation, or vulnerability hangovers (thanks to my friend Uncle Bear for that concept). Venus in Gemini makes a square to Neptune in Pisces today and we really want to believe that these feelings are the real deal. All feelings are real, but the ecstasy might not last. Neptune leads us into beautiful states of transcendence. Venus invites us in a little closer. This kind of seduction is hard to resist, especially under a sensuous Taurus Moon. Open to sensation and inspiration. We are meant to learn something. The lesson may be that letting down our guard won’t really kill us and vulnerability makes us beautiful. Friday, June 3. The Sun and Venus in Gemini have been working their way through the grand mutable cross this week. Today, both oppose Saturn in Sagittarius. Tomorrow’s New Moon in Gemini will again set off this aspect pattern. The Sun and Venus oppose Saturn once a year, but not always on the same day. Venus’ influence invites an opening into new understanding. Relationships are involved. Perhaps it is time to look again at your commitments. This is a time to check in with what Saturn is teaching us. The integration of the opposing signs of Sagittarius and Gemini is a step towards wholeness. Saturn in Sagittarius brings order and accountability to this freedom-loving sign. On the world scene, Saturn is revealing the karma associated with sloppy thinking, fundamentalism, and easy answers. Perhaps the Donald Trump phenomena may be Saturn showing us how seductive the invitation to not think is. Saturn wants us to sharpen our wits. The Sun and Venus in Gemini want us to be curious and open to ever more complexity. Exercise your mind through connection with others. June 4—New Moon: Dreaming. The potential of this New Moon resembles a dandelion seed head, a perfect sphere paused in readiness for the smallest breeze to send its seeds flying through the air. The chart for this New Moon shows a mutable grand cross aspect pattern. This pattern has been influential all week. Today, a seed—a dandelion seed—is sent aloft to influence the whole lunar cycle with this energy. Mutable energy is about seeking to understand, integrate, and move us forward to the next beginning. Mutable signs occur at the end of season. Their job is to resolve previous contradiction or conflict. But they are tricky, these mutable signs. They seldom leave the resolution alone as immutable truth. No, mutable signs are constantly adapting and mutating, sending out a multitude of options. It is up to the next cardinal sign to take one of those options and make a plan. I am trying to paint a picture of the unpredictability of this lunar cycle, yet give an idea that there is a reason we are here, and there is a lot to get from it. The month will be interesting. Hopefully, there will be breakthroughs. A grand cross, even with the flexible energy of mutability, can feel stuck at times. 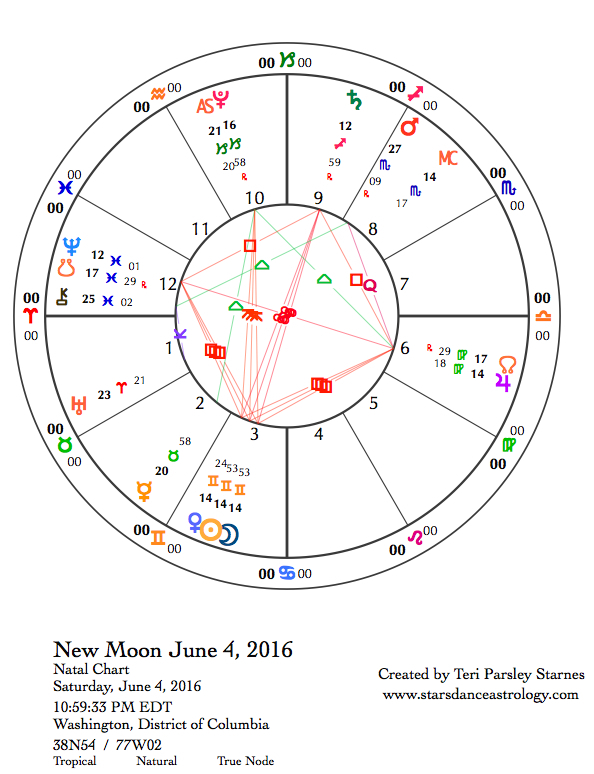 The chart for the New Moon shows a perfect conjunction of Venus, Sun and Moon. This feels like a blessing by the goddess of love. Lunar intentions about flexibility in love, curiosity about partners and friends, finding pleasure amidst the constant fluctuations of life are well supported. This trio is opposite serious Saturn in Sagittarius. This influence challenges us to apply the frivolous lessons of this lunar cycle to support long-range plans. The other planetary opposition is Jupiter in Virgo opposing Neptune in Pisces. Mutable flexibility will influence our beliefs and ideals too. Perfectionism is a trap; Jupiter points out that we can reach beyond mere improvement to a better understanding of the healing we need. Neptune encourages the messy emotions of grief and vulnerability. This is not the only influence of this lunar cycle. Mars has just returned to Scorpio in its retrograde journey. Just like Taurus provided an earthy grounding cord last month, Mars provides grounding through opening to the depths inside. Soul is activated when we are uncertain but willing. I am trying to stay as open-minded as a dandelion in seed as this new lunar cycle begins. For my intention, I want to cultivate readiness and curiosity. I desire the presence of mind to pause before reaction, to reflect before decisions, to wonder before I know. Life can change when we change our minds. This month could be about that. Sunday, June 5. Gemini can be delightfully carefree or frenetically overwhelmed. 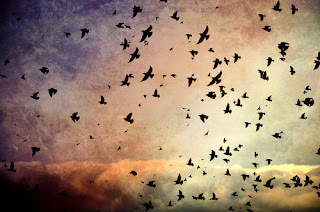 Yesterday’s New Moon may have stirred up some energy, so notice what you need. In the introduction to this week’s forecast I recommended a breathing practice that helps me de-stress. Find an explanation here https://yogainternational.com/article/view/5-ways-to-practice-bhramari The single aspect today is a supportive sextile between the Moon in Gemini and Uranus in Aries. Learn something new. Let curiosity lead you to discovery. *Read about the seeds of the Taurus lunar cycle here. With the desire stated. I began to listen for the answers. I often learn about a thing’s value by noticing what it is like to not have it. I have no earth in my own natal chart, so I am used to wondering what it would be like to have this element show up more strongly in my life. A funny thing happens when an element is missing, we learn to cultivate relationship with that element. Through courtship, we invite those qualities and honor the gifts that come with that element. This is in contrast to how often we take for granted the elements that are well represented in our charts. This isn’t to say we should not cultivate good relationship with those elements too. We should. This is the path to wholeness. I find there is always something to be learned from each element. Yet, this season, in this month, I most wanted to know how to rise up rooted like a tree: How to stop frittering away my time and energy by worry, how to slow down enough to drink in the beauty and pleasure offered by this season, how to be present enough to adjust easily when expectations aren’t met or plans go awry, how to get in touch with a deeper level of wisdom to answer the perplexing questions of my life. It would seem that this thing I am missing could help me live a more joyful life. What is it like to rise up rooted like a tree? I imagine that it feels like being supported in my aspirations to reach for the sky. I imagine that it feels like being both satisfied with the place I am and wondering what more there can be. The tree in my imagination is sure and solid yet flexible and rising. That feels just about right. The astrological weather lately has been challenging such a state of solid flexibility. Emphasis in the mutable signs has sensitized us to all the ways we want to understand and adapt to our complex world. We are more and more aware of trauma’s influences, seeing dysfunction in our governments and injustice in our systems. The recent Mercury retrograde through Taurus seemed like a hyper-charged experience of things going awry over and over. The ongoing Mars retrograde through Sagittarius (mutable fire) has simmered under the surface of emotional response. At times, it felt like living in a tinderbox about to ignite. It is interesting that the poem ends with the image of a bird. The Sun has moved out of Taurus and now inhabits Gemini (mutable air). The Taurus lunar cycle is just halfway done. There is much more to experience about surrendering to the earth’s intelligence. Yet, the sky is calling. We get to meet that sky when we learn to fall. Gravity’s pull helps us soar. Monday, May 23. The reverberations of the recent Full Moon begin to lessen. The Moon in Sagittarius enters a void-of course period mid-morning (CDT) after making an energizing trine to Uranus in Aries. This lack of aspects today provides an excellent opportunity to enjoy Sag’s innate optimism. Feel for the uplift of spirit. Insights bring meaning. Trying something new brings wisdom. Tuesday, May 24. Serious and curious. The Moon in Capricorn encourages responsibility and determination. Venus entering Gemini encourages serendipity and an open curiosity. Combine these forces and you have the power to use chance encounters to further a long-range goal. Venus opposes retrograding Mars in Sagittarius. Be on guard for either/or thinking. Venus in Gemini sees a multitude of options, each of them enticing. Mars in Sagittarius feels passionately about a singular truth. If we can embrace both of these desires, without negating either, we’ve won the game. The sextile between the Moon and Neptune at the end of the day says kick back and dream a little. 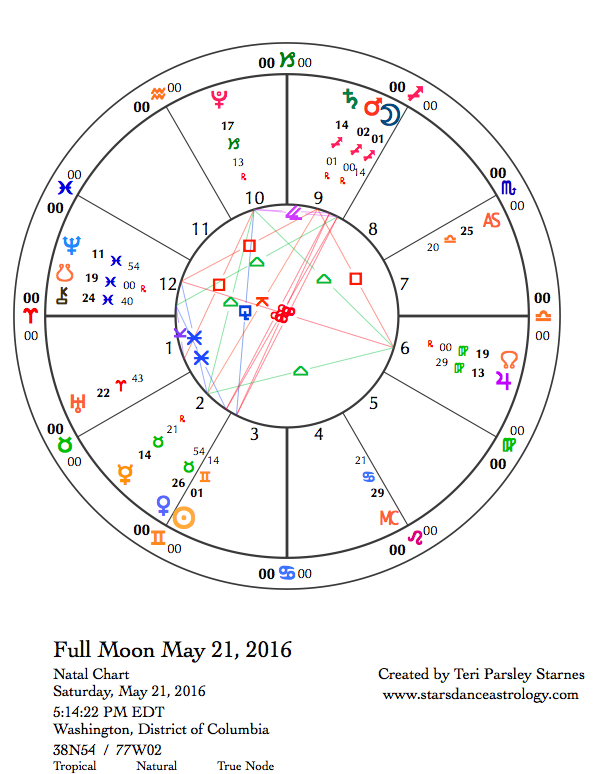 May 25—Disseminating Moon: Sharing. Mercury recently stationed direct while making trines to both Jupiter in Virgo and Pluto in Capricorn. In spite of potential upsets in thoughts, communications, and systems, the grounding influence of this grand earth trine has helped us find the ground beneath. Today, this grand earth trine is reinforced by the Moon in Capricorn. By next week, we will lose this support and have to grapple with planets in mutable signs squaring off and amping up stress levels; so this is a good moment to notice what you notice about earth’s intelligence. Do you take this source of wisdom for granted? Do you rely on it above all else? Will you make adjustments? Under this phase of the Moon, we begin to put together the value and meaning we’ve gained from intention. Pass it along to others. To honor the earth wisdom you seek, how will you give back to this intelligence? Earth encourages action. Tangible reality gives us feedback on which of these actions move us closer to our goals. The square between the Moon and Uranus in Aries at the end of the day (CDT) encourages actions that will bring change. Thursday, May 26. Jupiter and Saturn reach an important point in their synodic cycle today. A synodic cycle is the orbital relationship any two planets have with each other. Jupiter and Saturn conjoin every 20 years. In the time between these conjunctions, Jupiter separates, opposes, and approaches Saturn just like the Moon does in its cycle with the Sun. Today, Jupiter in Virgo squares Saturn in Sagittarius. This relationship is akin to the last quarter Moon phase. During that phase, we evaluate where we are at. This cycle began in 2000 in Taurus. Saturn governs realism. Jupiter governs optimism. They push and pull each other to create the paradigm we live within. What is possible? What work must we do to achieve it? This moment in their cycle aligns with this lunar cycle intention to surrender to earth’s intelligence. Where are we at in our relationship to earth (Taurus)? Adjustments are called for. Our beliefs can create a foundation for healing and alignment with earth intelligence. Our beliefs can also create the barrier to that foundation. We are at a choosing point. Let’s feed the enlivening choice with dedication to right relationship with the Earth. Friday, May 27. The square between Jupiter in Virgo and Saturn in Sagittarius colors more than the one day it is exact (which was yesterday). This is a signature aspect of this year. The ongoing square between Saturn and Neptune in Pisces is another one. All this mutable sign investigation can be unsettling as we extend antennas to take in more information and churn the data to try and come up with the right course of action. Add to this the fact that Mars takes a dive back into the probing sign of Scorpio today. Mars will be in Scorpio till the beginning of August. As the co-ruler of this sign, Mars is comfortable here. We may also feel the rightness of digging deeper to uncover the source and blocks around our passions. This energy is critical for meeting the challenges ahead. Much healing needs to happen around the right use of will. May this healing begin today. Saturday, May 28. In case we weren’t paying attention yesterday when Mars re-entered Scorpio, the Moon’s square to Mars today will make sure we do. This aspect highlights one fundamental contrast that can throw relationships into turmoil. Aquarius wants transparency and Scorpio wants to be hidden. When we can expand to appreciate both strategies, we are able to trust and appreciate each other just a little more. You might notice conflicts sparked by different approaches today. When the Moon moves into Pisces later in the day we switch into receptive/perceptive mode. This might mean you get in touch with past wounds around conflict or act to be the bridge between differing sides. May 29—Last Quarter Moon: Evaluating. Mercury hasn’t been moving very fast since turning direct last week. It is still holding down the grand earth trine from Taurus. Pluto in Capricorn and Jupiter in Virgo complete the pattern. Next week, this powerful earth influence will begin to break apart when Mercury starts to move more quickly. The grounding influence of this trine may come in handy as a grand mutable cross aspect pattern is activated by the Moon in Pisces. This pattern is stressful and conflict prone while a grand trine promotes access to an element’s strength. The planets involved in the mutable grand cross are Neptune and the Moon in Pisces, the Sun and Venus in Gemini, Jupiter in Virgo, and Saturn in Sagittarius. Mutable signs are seeking intelligence of all kinds. This is a gift and can be overwhelming when not balanced by a grounding influence. We can notice the support from earth as we expand in many directions today. Today marks the last week of the Taurus-seeded lunar cycle. As we begin to let go of this intention, we first pause to evaluate what has been learned, what has been attempted. What worked, what didn’t. Another good idea for this phase is to create an energetic anchor to come back to the earth’s intelligence you may have received this cycle. The next lunar cycle could find us moving lots of energy, sorting our priorities, making our choices. Mutable signs learn, integrate, and mutate so we can start again with a clean slate. We will be doing lots of that in the next lunar cycle. The earth wisdom of this cycle is important to moving through these shifts with clarity and purpose.